Dry eyes is becoming a common condition for people.The function of the tear film is to moisten the eye surface (cornea), prevent damage and inhibit the development of bacteria. The tear film is made up of 3 layers each with a specific task. If any of these layers are inadequate then dry eye can occur. 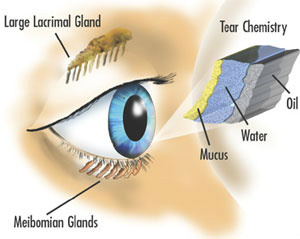 The inner layer is the mucin layer and it helps spread the watery middle layer of the tear film across the eye. The middle layer is the thickest layer and is known as the watery or aqueous layer. it keeps the eye lubricated and comfortable as well as washing out debris or dust that gets into the eyes. The outer most layer is known as the Oily or Lipid layer. It is produced by the meimobian glands along the lids margins. This layer is a protective coating to reduce evaporation of the tears from the atmosphere. Blurred Vision that may momentarily improve with blinking. Eyes may also appear red and there may be excessive tearing; this is because the eye isn't getting enough lubrication and thus produces more tears. However, these tears do not help alleviate the symptoms and can often be just as annoying as the dry eyes. Dry eyes are often worse in different environments particularly dry or windy atmospheres such as air conditioning and central heating. An Ophthalmologist or an Optometrist will be able to asses the reason for your dry eyes with a variety of tests. Sometimes there is no cure but only management of the dry eye so that symptoms are not severe. Management of the dry eye will depend on the actual cause determined by your Ophthalmologist or Optometrist.